"Ghost winner" in PCSO Lotto? - Balita Boss! Balita Boss! News PCSO "Ghost winner" in PCSO Lotto? "Ghost winner" in PCSO Lotto? There’s a ‘ghost’ in the Philippine government, a ghost project. Now, there’s an issue about another ‘ghost’ in the Philippines, a “ghost winner” in Philippine Charity Sweeptakes Office (PCSO). The Facebook page of Filipino’s Patriotism posted an alleged photo of the draw results last Monday, April 7, 2014, showing zero winners for PCSO 6/55 Grandlotto with a jackpot prize of Php 249,841,572. The image also listed only two and not 25 as reported bettors won the Php 169,410 prize after getting five of the six-number winning combination. 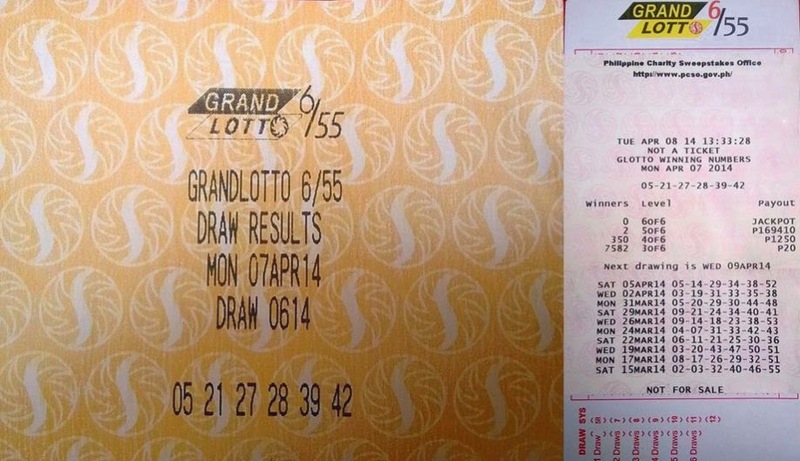 Because of that photo, many netizens think that there’s a “ghost winner” in PCSO Lotto. One Facebook user, who purportedly works for PCSO, explained that there are two system providers for lotto operations, the Philippine Gaming and Management Corp. (PGMC) and the Pacific Online System Corp. (POSC). “The 1st pic is a Pacific Online ticket. It says there na 0 jackpot winner. Tama po yun, kasi po ang jackpot winner ay tumaya sa PGMC. Kung mapapansin po nating mga mananaya ng lotto merong outlet na malaki ang ticket at merong maliit. Magkaiba po kasing makina ang gamit ng 2 service provider na yan,” he said. Atty. Jose Ferdinand Rojas, the General Manager of the PCSO, said the allegation was not true. An official statement posted on PCSO website clarified that the photo came only from the POSC, a service provider for the Visayas-Mindanao Area. According also to PCSO GM Rojas statement, the winner of the Grand Lotto 6/55 draw on April 7 is from Muntinlupa City, a 59-year-old female private office worker. She claimed the prize Thursday. “After validation through the PCSO’s lotto machine that it was genuine and that her favorite bet numbers, 05-21-27-28-39-42, matched the 6/55 jackpot winning numbers, 39-21-42-28-05-27, her prize was processed and handed to her about an hour later in the form of a check representing the lump sum amount of P249,841,572, the total jackpot prize for 6/55 on April 7,” the statement said. For safety and security reasons, PCSO cannot reveal the identities of the lotto jackpot winners. Perhaps this is the reason netizens doubt if there really are winners. This site, Balita Boss, covers PCSO Lotto results every day and like others, we want a fair and honest lotto draws.